, called the good lord Cobham, the first author, as well as the first martyr, among our nobility, was born in the fourteenth century, in the reign of Edward III. 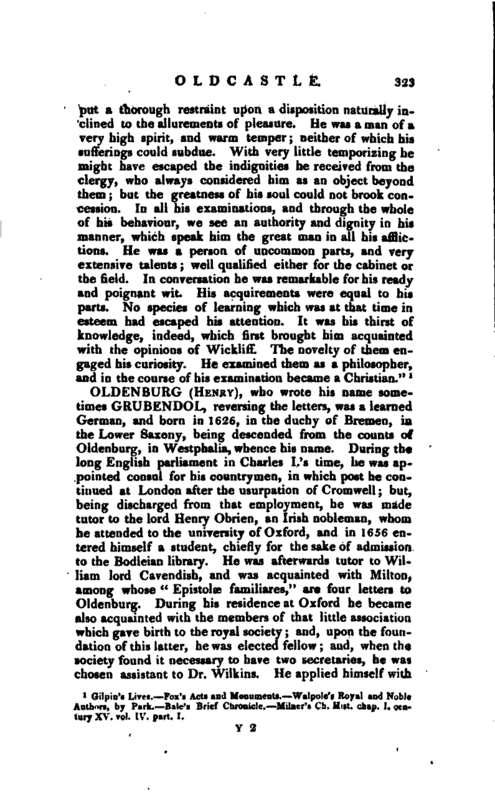 He obtained his peerage by marrying the heiress of that lord Cobham, who, with so much | virtue and patriotism opposed the tyranny of Richard IL and, with the estate and title of his father-in-law, seems also to have taken possession of his virtue and independent spirit. The famous statute against provisors was by his means revived, and guarded by severer penalties. He was one of the leaders in the reforming party, who drew up a number of articles against the corruptions which then prevailed among churchmen, and presented them, in the form of a remonstrance, to the Commons. He was at great expence in collecting and transcribing the works of Wickliff, which he dispersed among the people; and he maintained a great number of his disciples as itinerant preachers in many parts of the country. These things naturally awakened the resentment of the clergy against him. In the reign of Henry IV. he had the command of an English army in France, which was at that time a scene of great confusion, through the competition of the Orleanand Burgundian factions; and obliged the duke of Orleans to raise the siege of Paris. In the reign of Henry V. he was accused of heresy, and the growth of it was particularly attributed to his influence. The king, with whom lord Cobham was a domestic in his court, delayed the prosecution against him; and undertook to reason with him himself, and to reduce him from his errors. Lord Cobham’s answer is upon record. “I ever was,” said he, “a dutiful subject to your majesty, and ever will be. Next to God, I profess obedience to my king; but as to the spiritual dominion of the pope, I never could see on what foundation it is claimed, nor can I pay him any obedience. It is sure as God’s word is true, he is the great antichrist foretold in holy writ.” This answer so exceedingly shocked the king, that, turning away in visible displeasure, he withdrew his favour from him, and left him to the censures of the church. He was summoned to appear before the archbishop; and, not appearing, was pronounced contumacious, and excommunicated. In hopes to avoid the impending storm, he waited upon the king with a confession of nis faith in writing, in his hand; and, while he was in his presence, a person entered the chamber, cited him to appear before the archbishop, and he was immediately hurried to the Tower. He was soon after brought before the archbishop, and read his opinion of these articles, on which he supposed he was called in question, viz. the Lord’s supper, penance, images, and pilgrimages. Hewas told, | that in some parts he had not been sufficiently explicit that on all these points holy church had determined by which determinations all Christians ought to abide and that these determinations should be given him as a direction of his faith; and in a few days he must appear again and give his opinion. At the time, he said among other things, “that he knew none holier than Christ and the apostles and that these determinations were surely none of theirs, as they were against scripture.” In conclusion, he was condemned as an heretic, and remanded to the Tower, from which place he escaped, and lay concealed in Wales. 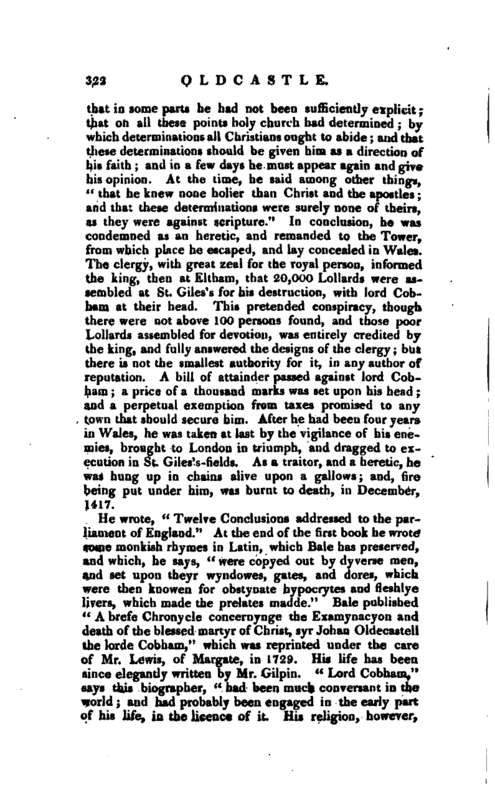 The clergy, with great zeal for the royal person, informed the king, then at Eltham, that 20,000 Lollards were assembled at St. Giles’s for his destruction, with lord Cobham at their head. This pretended conspiracy, though there were not above 100 persons found, and those poor Lollards assembled for devotion, was entirely credited by the king, and fully answered the designs of the clergy; but there is not the smallest authority for it, in any author of reputation. 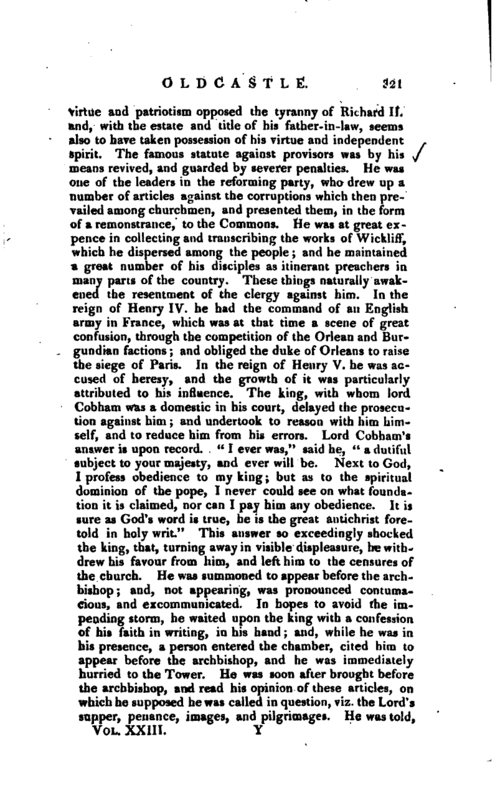 A bill of attainder passed against lord Cobham; a price of a thousand marks was set upon his head; and a perpetual exemption from taxes promised to any town that should secure him. After he had been four years in Wales, he was taken at last by the vigilance of his enemies, brought to London in triumph, and dragged to execution in St. Giles’s-fields. As a traitor, and a heretic, he was hung up in chains alive upon a gallows; and, fire being put under him, was burnt to death, in December, 1417. Gilpin’s Lives. 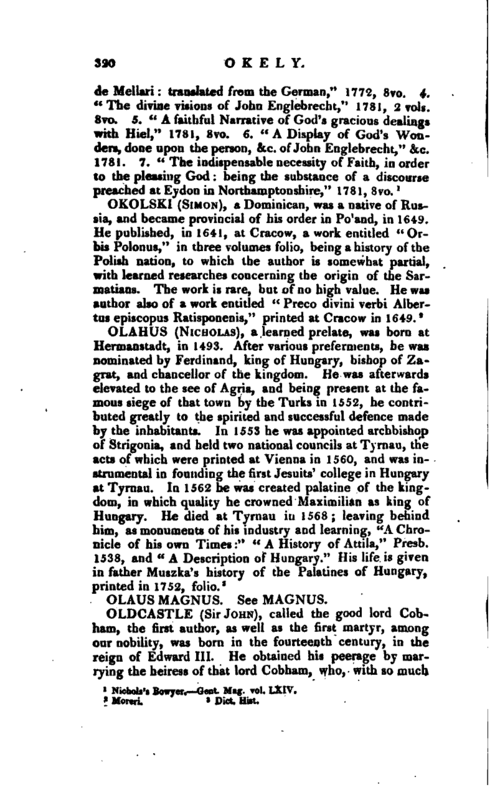 Fox’s Acts and Monuments. Walpole’s Royal and Noble Authors, by Park. Bale’s Brief Chronicle. Milner’s Ch. Hist. chap. J, century XV. vol. IV. part. I.